One of the things I like to do is to validate the quality of my work occasionally. I recently did a long term timing accuracy test of one of my 30cm WordClocks. The test started on 20 May 2015, and ran through to 2 August 2015 – a total of 75 days (6,480,000 seconds) – I set the clock to the correct time (against a GPS standard), and I measured the time change every couple of days. I am pleased to announce that in those 75 days, the clock maintained the correct time to within 96 seconds (one minute and 36 seconds). That is a wonderful effort from a simple quartz oscillator. Hang on – Am I saying that not keeping time is a good thing – Isn’t that really a bad thing??? These are all beautiful timepieces that are worthy of mention – and they also cost significantly more than my clocks do. Yes, there are clocks that have GPS receivers installed in them and that allows them to maintain time in the order of 10 seconds per 500 years, but these have to have external antennas and modules to allow the GPS signal to be received. So… My clocks use a quartz crystal, which is specified at 20 parts per million in accuracy, so 96 seconds over 75 days works out to about 1.28 seconds per day, which I consider to be insignificant. It certainty is not noticeable when the display is updated every 5 minutes 🙂 We have to stay sane when it comes to super accurate timekeeping. Now – I am not discounting GPS based clocks, I think they are neat. One of the things I would like to do is to look at the feasibility of adding a GPS receiver option to my 30 cm and above wall clocks. It will add a small optional cost to the clocks for the GPS receiver and antenna, but would be a very interesting thought. That was a whirlwind 2014 – Thank you to everybody who made the wonderful year that it was. Christmas was a great break, and my family stole me away to Brisbane for a week, so that was restful. The year has started with enthusiasm, and I have decided to offer a Free Black DeskDeskclock to one lucky client who makes a purchase during January. That way, you can have a clock for at home and at the office. We hope everybody had a safe and happy break, and look forward to wonderful things during 2015. Hi everybody. I have been receiving about 30 emails a minute from all over the world for the last couple of days. These have been ‘undeliverable’ emails from a spam campaign that is being sent from a series of Russian IP Addresses, where they have helpfully put my email (doug@dougswordclock.com) as the return address. To make my position crystal clear, Dougs Word Clocks.com has never, and will never participate in a spam campaign. We make clocks – not fraudulent emails. I have decided to put this on both my web site as well as Facebook, as there are a number of people who have decided to respond, who are unaware that somebody can put anybody’s return address on an email – Just like you can write anything on a postal mail. In happier news, Today I have completed the Christmas orders – which is fortunate, as I am now waiting for more circuit boards for my 30cm clocks. WOW – Just WOW. In the coming short period, I will be turning this concept into reality, and it will look amazing. But in the meantime, it is Saturday morning here in Sunny Canberra, Australia – the temperature is a balmy 4 degrees Celsius outside, and I am off to the workshop! Wish me luck, and Stay Tuned! Not only did we make lots of clock frames this weekend, but I was able to spend some time on the DeskClock software. When I originally designed the alarm, I worked hard to make sure that it was a gentle soft beep. Some people have been concerned that the alarm was very quiet, so, after lots of work examining resonance, I have significantly increased the volume of the alarm. I have to point out that it is *not* as loud as the alarm clock that I made as a kid, where I used an alarm siren as the sounder……. WOW – I just looked, and the last blog post was in January of this year. Lets have a look at what we have achieved in that time. 2. We have another employee with us helping out. 3. Doug has designed a new range of vintage style clocks – Watch this space, her is considering one that looks like an old TV set! 4. 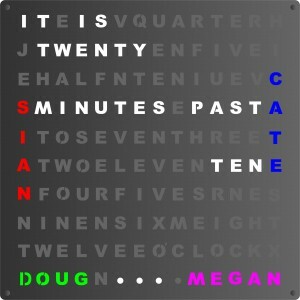 Doug has been experimenting with fonts – The lower case clocks are spectacular. 5. Doug still can’t Blog if his life depended on it 🙂 At least he is great at updating the facebook page. Wow – We have received a pre-order for our color chaos clock! Thanks so much for helping me get it started. The circuit board layout is 95% complete – there is just a little fiddly work to do on making sure that the silk screen (The black printed words that tell me where the parts are supposed to go) is correct. I am expecting to send the design off to the PCB manufacturers in about 2 weeks (After I have triple checked that it is correct). – Should individual words be varying colors across the face? – Should each letter within a word be a different color? – Should the entire face be the same slowly changing color? If you have any ideas on this, send me an email (doug@dougswordclock.com) – Lets get a conversation started. Of course, I will post photos of the completed boards when I get them assembled after they come back. Stay tuned – MUCH excitement to follow. You may have noticed that the face styles for the 30cm clocks (Standard clock, Custom clock, and Chaos clock) have all changed from vinyl to ‘Creative Faces’. As you are probably aware, most of the clock faces were made from a sheet of cut vinyl which was applied over a sheet of acrylic for rigidity. Now that I have perfected the new ‘Creative Face’ style, I have decided to retire the vinyl faces from the 30 cm clocks as the creative faces have a much greater impact and just look so amazing. Even though the creative faces cost a little more in material costs, they save in labor costs, so I have been able to retain the same pricing. I will keep offering vinyl faces for the 50cm and 70cm clocks, as they are too big for me to laser cut – The largest sheet I can cut is 43cm x 73cm until I upgrade my laser cutter – but thats a *long* way off. Of course, the kits will stay the same, as I want people to still be able to make their own clocks if they want to. If you have any questions or comments you are very welcome to email me at doug@dougswordclocks.com. As I mentioned on Facebook, it has been a wonderfully amazing year for us here at DougsWordClocks.com – We setup an actual company, and have developed better products, employed a book keeper (I can’t tell you how happy that makes me), and met lots of people online who have really enjoyed their beautiful clocks. To celebrate the end of Financial year (In Australia it is from Jul1 – Jun30), we have decided to give away a Desk Clock to Three lucky people who make orders between 15 June and 30 June. To be eligible you simply have to make a purchase (a kit, or even a 70cm clock 🙂 ) We will choose three people at random, and ask them what type of DeskClock they would like. Simple as that. Hmm – That was me shouting….. But thats ok.
Megan and my first Valentines Day was spent with us replacing the engine in my ’74 Totota Corolla – I seem to remember that she was above the engine bay and I was under the car when we realised that! It was so romantic… NOT! How things have changed. Because it is Valentines Day, I have decided to discount our DeskClock by about 10% (It was my Mum’s favourite) for the next couple of weeks. I know that you won’t have it to give to your loved one today – but at least they will be surprised by the extra special gift once we finish making it for you. I hope that you have a wonderful day – spend it with somebody that you love – spend it doing something that you both love.